Orange County GOP chairman Tom Fuentes maintains he was unaware that Diocese of Orange priests molested children during the years he served as the diocese’s communications director, from 1976 to 1989. But church documents obtained by the Weekly reveal that Fuentes for five years supervised a priest caught in flagrante delicto with a 13-year-old boy in a Sacramento area graveyard. Now a lawyer suing the Diocese of Sacramento on behalf of the victim wants to talk to Fuentes. Father Jerome Henson was head pastor at St. John the Baptist Church in Costa Mesa until the Orange diocese placed him on inactive leave last year when church officials learned of a police report detailing his 1981 nighttime boneyard tryst. Henson first came to the diocese in 1983 to direct its television department, where he remained for six years. As communications director, Fuentes oversaw the television department five of those years. Steven Sellwood, who has been the diocese television director since 1994, says he works closely with the communications director, whom he meets with "on an almost weekly basis." The role involves determining which TV programming will be beamed into parochial classrooms, working with students involved in production and frequently discussing content with the communications chief. Why Henson was placed in the television department upon his arrival in Orange County remains uncertain. It was once common within the Roman Catholic Church for parish priests who had been accused of sexual abuse to be moved into positions—at least temporarily—that limited their interactions with parishioners. Henson has returned to his Dominican headquarters in Sacramento and could not be reached for comment. Fuentes did not return the Weekly’s calls for comment on this story. And Monsignor Lawrence Baird, Henson’s boss when he took over as communications director upon Fuentes’ resignation in 1989, refuses to speak with the press. However, revelations in an Aug. 5, 1981, police report would have given diocese officials reason to place Henson in a job that kept him away from children. The report also indicates that former Orange County Bishop Norman McFarland should have been aware of the molestation allegations against Henson—both before and after he came to OC. The report from the police department in the Sacramento suburb of Benicia states that an officer found Henson with a 13-year-old boy "wearing a tank-top and blue athletic-type shorts" leaning against a graveyard fence. "[The victim] had his back to the fence with his hands holding on to the top bar," the report notes. "[The victim] was suspended in the air with both of his legs draped over Henson’s shoulders. Henson was facing [the victim], both subjects were clothed at the time." Once Henson caught sight of the patrol unit, he removed the boy’s legs from his shoulders, causing the kid to slam into the ground. No charges were filed against Henson, mainly because it was impossible: the child didn’t press charges at the time and a mere five days later, "arrangements were made . . . to immediately transfer Henson to a parish in Reno, Nev."
Church records show that Henson was first placed in St. Thomas Aquinas Cathedral, the main parish in the Diocese of Reno, where he remained for a year. At that time, McFarland ran the diocese. The records are unclear where Henson landed next; some accounts have him resurfacing in Salt Lake City. 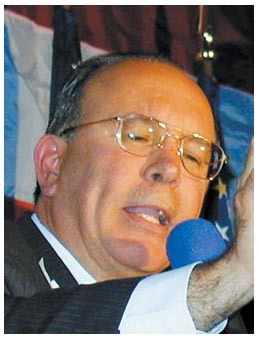 But he was reassigned to the Diocese of Orange in 1983, when he joined Fuentes’ team. McFarland handled the transfer, and then followed Henson to Orange County three years later. The Benicia police report states that the Diocese of Sacramento already had been alerted to alleged sexual misconduct by Henson before the graveyard incident. A diocesan church official is quoted as having "suspected Father Jerome may have been too involved with different young boys at the parish, and he is going to speak to his superiors in the church and attempt to get [Henson] transferred out of the community as soon as possible and also have his assignments changed so that Father [Henson] will be working with adults and not with so many young boys." That admission indicates that the Reno and Orange dioceses should have known about Henson’s past—at least, that’s the conclusion to be reached after talking with current Diocese of Orange spokesman Father Joe Fenton. Though not referring specifically to the Henson case, Fenton said that when one diocese accepts a priest from another, the originating diocese must reveal any allegations against the incoming priest. "If the allegation originated in one diocese," says Fenton, "that diocese is responsible for clearing up the allegation. They must disclose from one diocese to another any allegation." That means at least one Orange diocese official should have been familiar with Henson’s troubles: McFarland, who served as Orange County’s bishop from 1986 until his retirement in 1998. McFarland was bishop of Reno at the time of Henson’s transfer from Sacramento and presided over Henson’s transfer to the Diocese of Orange in 1984. When McFarland assumed the Orange County bishopric in 1986, Henson had already served in the county for three years. And under McFarland’s watch, Henson began saying Mass again in 1991, starting at Saint Anthony Claret in Anaheim. A lawsuit is pending against Henson and the Sacramento diocese seeking "substantial" damages for the alleged graveside molestation. Fenton doesn’t discount that officials from the Orange diocese might be called to take the stand even though they aren’t currently named in the lawsuit. The Orange diocese’s official position is that no one in its hierarchy was aware of the allegations against Henson. "We wouldn’t know anything because in those days they didn’t pass [police reports] around," insists Fenton, who recently replaced Baird as the Orange diocese communications director. "Nothing in the file that had been sent to us on Henson [from the Reno Diocese] stated any allegations. We knew nothing about the Benicia case until it became public. When the police report emerged, we immediately dismissed him." Larry Drivon, the attorney representing the alleged victim, scoffs at the diocese’s claim of ignorance regarding Henson’s past. "I find it incredible that McFarland or the Diocese of Orange has no knowledge with the immediate background of the priest he accepted from Sacramento under those circumstances while in Reno," Drivon says. "Reno agreed to accept him on a moment’s notice. That’s unusual. One bishop doesn’t call up another and say, ‘We’re going to send you someone in 15 minutes,’ and the other bishop doesn’t ask why. Is McFarland prepared to say that he accepted this priest on a moment’s notice while in Reno and never asked any questions about the reason for the transfer and say it under oath? "Fuentes, McFarland—everybody’s deposition will be taken."